petition: European Union stop the exploitation of the Sorbas/Tabernas aquifer NOW! European Union stop the exploitation of the Sorbas/Tabernas aquifer NOW! Illegal man-made boreholes (wells) are sucking dry the natural springs in the Province of Almeria, Spain. This is having a devastating impact on the unique ecosystem which supports many rare and endangered species plus the livelihood of 7,000 people. Please sign this petition to ask the EU to take action to stop these breaches in water regulations. • EU directives protecting a totally unique ecosystem are being ignored. • Vast quantities of water are being stolen daily to further corporate profit-motivated interests. • Local communities are having to import their water as wells run dry and sustainable farmers are forced to watch their land become a desert. WHY?...because the fossil water aquifer underlying the Sorbas/Tabernas basin in the Province of Almeria, Spain has been breached by countless ILLEGAL boreholes (man made wells that are used to pump water to the surface), sucking dry all natural springs. Vast tracts of semi-arid desert in the Sorbas/Tabernas area, recently purchased, are being terraformed and intensively planted with millions of olive trees...drip irrigated by water extracted from the aquifer...with no regard for the environmental impact. The Los Molinos del Rio Aguas spring has decreased dramatically from 40 litres per second to 3.2 litres per second in just a few years. Please sign this petition to ask the EU to implement existing water regulations properly, to protect the local area and its people from devastating water loss. This spring created an oasis which provides a home and habitat to unique flora and fauna. It's located in the Parque Natural Karst en Yesos de Sorbas, a unique karst landscape composed of gypsum (yeso). This park contains gypsophyte flora of exceptional botanical interest, with many rare or endangered species, including the southeastern peninsular tortoise, Tortuga Mora (assessed as vulnerable in the IUCN Red List). As the spring dries up due to the over-exploitation of its supporting aquifer, the river it creates is dying. An entire ecosystem will cease to exist...as does the livelihood of 7,000 people, already affected by water shortages. We ask the European Union to URGENTLY enforce protection for the Paraje Natural Karst en Yeso de Sorbas, protected under European Law, LIC Directive 92/43, Special Protection Areas for Birds, ZEPA, Directive 79/409, and Special Area of Conservation, Habitats, ZEC, integral to the Natura 2000, Directive 92/43. This protected area no longer has sufficient water to maintain the eco-system protected under EU Law. • We ask for the EU to step in NOW. • We ask for, at least, a temporary closure of all "boreholes", using the "precautionary principle", pending their environmental impact study. • We ask the EU to uphold its own regulations protecting the Rights of Nature over corporate greed. Please add your signature to our petition. Head over to https://www.facebook.com/riodeaguas to see more wildlife photos of this beautiful area. El Manantial de Los Molinos del Rio Aguas está muriendo. El drenado insostenible que está soportando el acuífero Alto Aguas ha provocado una dramática reducción en su caudal, de 40 litros por segundo a 3.2 litros por segundo durante los últimos años. Necesitamos actuar ya. El acuífero está siendo sobreexplotado un 330%, principalmente a causa de la irrigación de plantaciones de olivo, y la situación empeora. Desde 2010 dos millones de olivos se han plantado. Un millón más se está plantando ahora. Acuerdos y leyes parecen estar a favor de la agricultura industrial. Una agricultura que busca recompensa financiera a costa de recursos hídricos no renovables del acuífero más importante de la provincia de Almería. Muchas Gracias por su ayudar! Thank you so much for your support. The signatures have been sent to a number of MEPs at the EU to ensure it gets seen and action is taken. The aquifer continues to be exploited with new wells being dug every day. We continue to fight for this endangered eco system. Please keep sharing! We'll keep you informed of progress. Hi lovely signers, the petition has done so well and within a week we're almost at our target, 927 signatures, thank you so much, you're all stars. I've increased our target to 2,000 to have more impact when presented to the EU - if we don't reach this quickly we'll go with what we have - speed is of the essence! 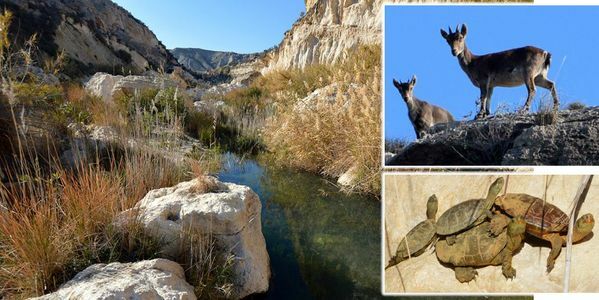 The Costa Almeria News has written an article about the water problem and put a link to our petition, but of course we'd really appreciate it if you could keep sharing as well. 16.25 on Saturday 11 July and we're on 546 signatures after just 2 days! Thank you so much everyone for your support and brilliant comments, it means a lot, in fact it means the world! Please keep sharing this petition so we can reach our target quickly and get this off to the EU. We need them to act quickly to save the beautiful Rio de Aguas and it's wildlife. Head over to https://www.facebook.com/riodeaguas to see photos and videos of the wildlife we're trying to save.